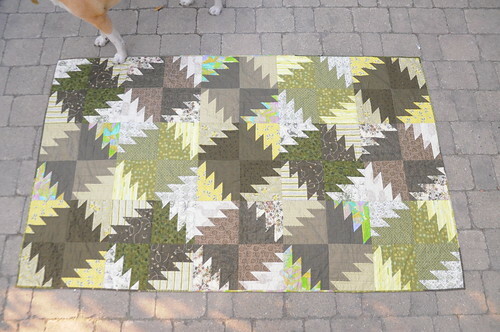 This ‘ode to green’ quilt is absolutely perfect for our couch. It worked out to be just the right length. 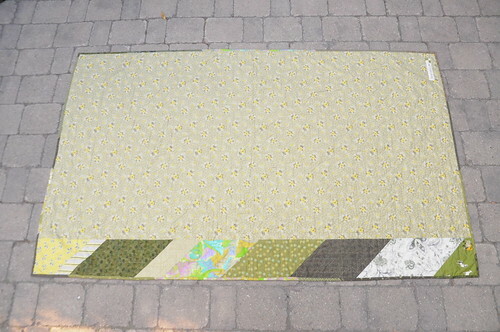 For the backing, I used a large swath of Denyse Schmidt’s wallflower in piney woods green. I just love this vintage-y print! I also used scraps from the front to create the stripe down the side. To echo the buzz saw points on the front, I cut the scraps on an angle. I machine quilted it with two different Valdani variegated threads and echoed the buzz saw pattern about a half inch around the inside and then the outside. I really like the effect this gives. The binding is also made from scraps from the quilt. I find this most satisfying when I get to the end to use up leftover bits to make the binding. For the quilt label, I hand embroidered using the dark variegated thread I used to machine quilt. To make the label a bit more interesting, I did a teeny tiny bit of patchwork and attached it to the end. Cute! I think I will always do this for future labels. Yay! I can finally cross something else off my finishing list. 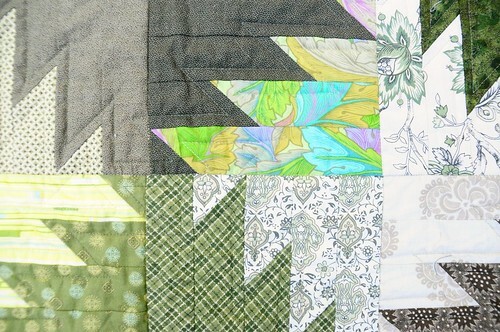 Which is perfect timing because tonight I’m starting to make the Cog & Wheel quilt! I love the label! 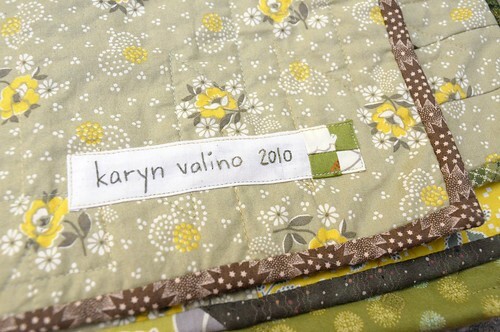 I’ve never thought of putting a scrap of patchwork into my labels. Great idea! Can’t wait for this class to be offered again Karyn – it’s so great! 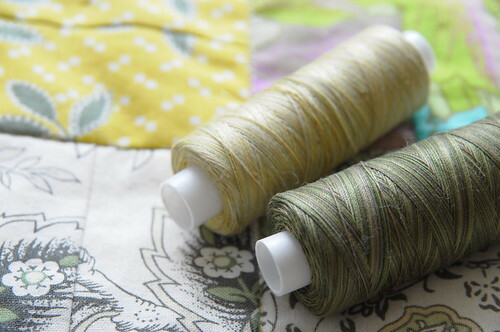 In the meantime, I’ve stocked up on variegated thread for my next quilt! So excited! sooo beautiful. haven’t found any shop in LA with your selection of fabric & classes. seeing this makes me miss toronto! Cutest little label EVER! Gold Star! It’s lovely Karyn – great job! Stunning! Inspiring as always Karyn. Varigated thread – now on my “acquire” list! Do you think there might be a class on machine quilting (stippling, wonky lines etc) some day? Dang that is gorgeous!!!! You are AMAZING. this is SO gorgeous!!! You seriously have the best eye for color!!!! So beautiful! It will look amazing on your sofa! It’s sooooooo stunning! I love the mix of the subdued colours with the bright florals. And the print on the back is super sweet! gorgeous! i love that little splash of the bright floral as well!! !